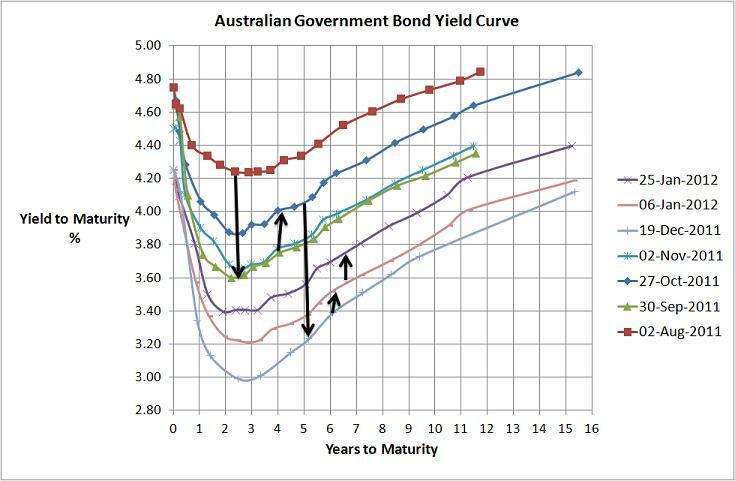 Its been a few weeks since I provided an update on the local government yield curve and consistent with the slight improvement in the sharemarket the Australian Government Bond Yield Curve has indicated a better outlook for the local economy. As the chart shows, since 6 January the yield curve has increased around 20bps across all maturities which isn’t a bad increase but yields still aren’t as high as they were last November. Current figures still suggest the Reserve Bank will decrease its cash rate next meeting and the shape of the curve is consistent with weaker economic outlook suggested by the IMF and World Bank reports. It also suggests that inflation continues to be a non-threat and the ABS inflation figures showed that the market was pretty much correct by dismissing inflation over recent months. Since October the S&P500 has rallied around 20% in the face of some pretty ugly political behaviour in both the US and Europe regarding their respective economies and that’s quite a surprise. 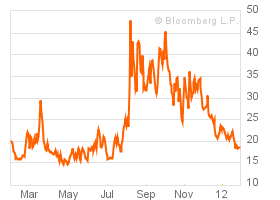 This is also supported by the downtrend in the VIX…see below chart…given the current downside risks I tend to think this trend will reverse and volatlility will increase. I don’t know what direction equity markets will go but my thoughts are to stay conservative…there’s a lot of water to pass under the economic bridge before catastrophic risks (global/European banking meltdown) is off the table. Whilst the market’s suggesting the risk is reducing its still there.